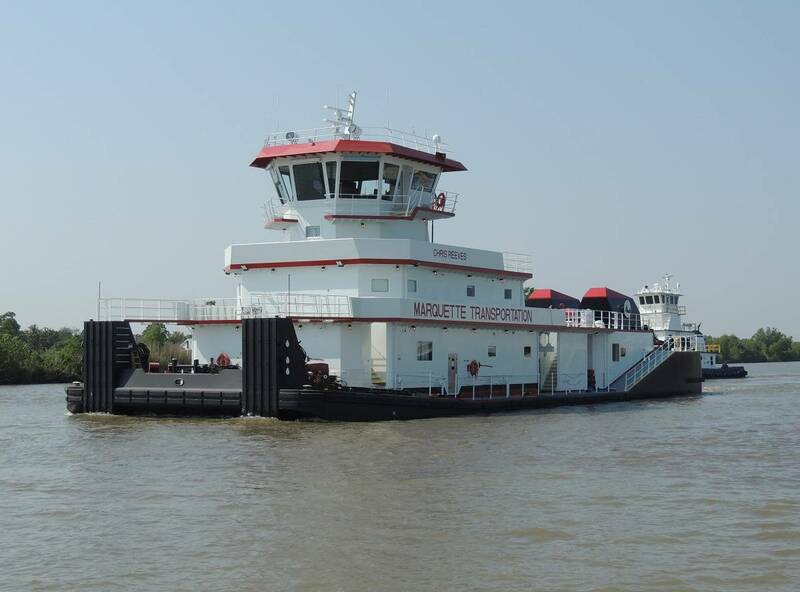 Louisiana shipyard C&C Marine and Repair has delivered the second towboat in a series of three 6,600 hp, 160’ x 50’ triple-screw z-drive newbuilds for Marquette Transportation Company. The delivery of the new towboat m/v Chris Reeves comes three months after the series' lead vessel m/v Cindy L. Erickson was handed over in February 2018. The third in the series is scheduled for delivery this August, with a fourth optional towboat lined up for delivery in December. Chris Reeves was designed by CT Marine, based in Portland, Maine and includes three Cummins QSK60-M main engines that are paired to three Steerprop SP25D azimuthing z-drive thrusters. The triple azimuthing z-drive configuration allows for optimal speed, power and maneuverability, the builder said. In addition, the z-drives operate at lower engine loads to boost fuel efficiency. The towboat offers a total of 13 beds. The vessel’s superstructure is supported on a bed of springs for added crew comfort and a soft-core jointer system was installed in the accommodation spaces for added comfort and fire safety. C&C Marine and Repair noted it is no stranger to building vessels outfitted with triple-z drives. In 2017, the Belle Chasse, La. yard built and delivered three such vessels for SCF Marine, all within eight months of each other.